Several wonderful red wines have been made in Pessac-Léognan this year but the real successes are amongst the whites, not just up at the highest echelons but further down there are many refreshing, fruity white wines to be had too. The very best are rich, weighty, almost fat, with a fraction less zip than 2011, but very attractive nevertheless. The reds? I found them a little bit of a mixed bunch. There is no doubt that the wet weather caused problems for the Cabernets as it did elsewhere. Some of the Cabernet Franc and Cabernet Sauvignon, while certainly ‘fresh’, were often angular in tannin, and many are a bit ‘grippy’ and ‘chewy’, even despite the fat, ripe Merlot on offer. My overall feeling with these is that you need to tread carefully. That said, it’s clear that great effort was put in by proprietors to try and make the very best reds they could in a challenging year, one that got increasingly so as the harvest progressed. Topping Pessac-Léognan in both categories are undoubtedly the Clarence-Dillion properties Chateau Haut-Brion and Chateau La Mission Haut-Brion. The reds are amongst the best in the vintage, both with 60%+ Merlot in their respective blends. For me Haut-Brion is perhaps red wine of the vintage. Certainly Haut-Brion Blanc is white wine of the vintage. Maybe no surprise there. Chateau Pape Clément also has got it right wonderfully too. The red, with 65% Merlot in the blend, is opulent and seductive. The white is very good indeed, as is Chateau Smith Haut Lafitte’s as I’ve reported earlier. At the UGC tasting I was very impressed with Chateau Bouscaut, both red and white. The white is really full and has lots of flavour and the red feels a good effort for the vintage. 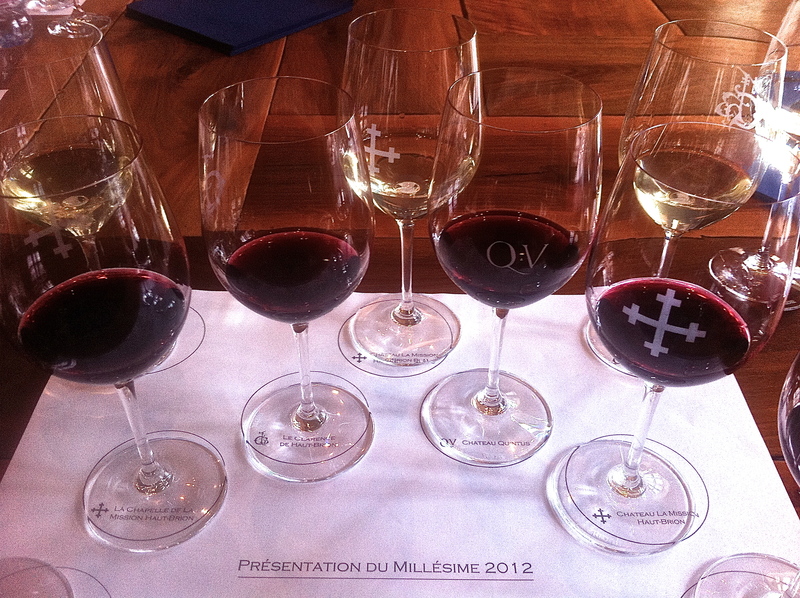 Chateau Malartic-Lagravière has pulled out the stops and made excellent whites and reds. Likewise Domaine de Chevalier impresses in both departments. The white is wonderfully pure with great depth and length and the red has plenty of fruit. Chateau Carbonnieux has produced a classically fine and lean white and a full, if chewy, red. UGC host Chateau Olivier has also produced a very nice white and a spicy, elegant red. Chateau de Fieuzal has made a weighty white and a red with lots of fruit and chew. I’ve written earlier on the very dense Chateau Haut-Bailly which I always find pretty backward at these primeur tastings but which comes good with a few years in bottle. For me it’s almost always tannic early on. Chateau Larrivet Haut-Brion has made a deliciously floral white [it often does] and a good red. Chateau Haut-Bergey has produced a successful white, though the red felt a little disjointed. I’ve already mentioned Chateau Smith Haut Lafitte’s delicious white. It’s red is a very good effort indeed. I tasted it twice and I thought it a real success on both occasions. Outside Haut-Brion, La Mission and Pape Clément, it was certainly the next most impressive red in the appellation for me. Chateau La Louvière has made a very good, modern white and a reasonably elegant red. Chateau Pique Caillou was less impressive in both departments than in recent years [it’s usually one to get excited about from a value point-of-view] as was Chateau de France. Chateau Latour-Martillac made a full, spicy white with lots of fruit and a stalky, fresh red with grip but plenty of guts. Overall I came away slightly less impressed with the reds here than I expected, even given the vintage. There is no doubt that the bouts of increasingly heavy rain in October, and increasingly gloomy forecasts, meant that there was [understandable] urgency to harvest the Cabernets sooner than many estates would have liked. This is apparent in the rather angular tannins in some cases, this despite the plushness and ripeness offered by the fully ripe Merlot, as alluded to in the intro. 2012 is very much a vintage in which you have to pick carefully. It’s maybe a bit of a cliché to talk of a game of two halves, but it seems doubly so to me here, between white and red [generally] and between Merlot and the Cabernets [particularly]. 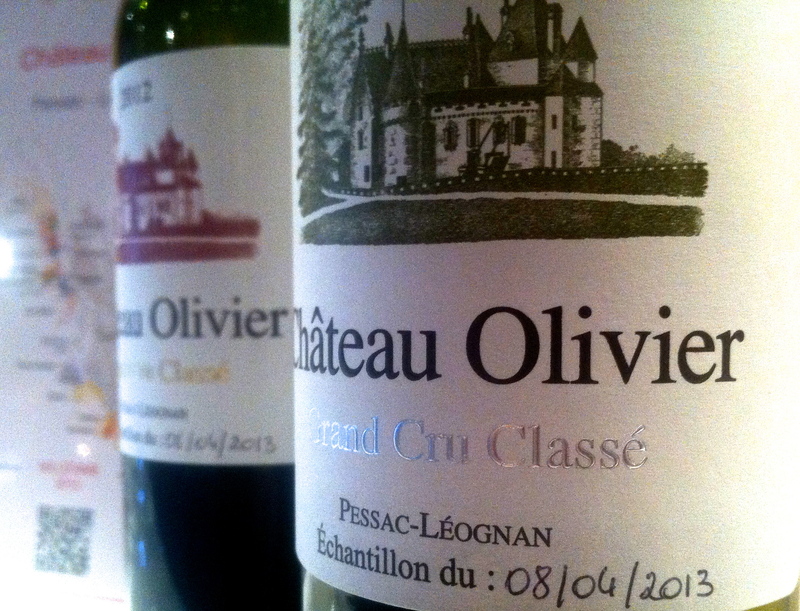 The Monday of primeurs week was also given over to a comprehensive tasting of the other chateaux of Pessac-Léognan. I tried to taste as many as I could of these [the tasting itself was extremely busy and packed which slowed things down a fair bit]. There were lots of delicious, appetizing whites on offer. I think it’s fair to say that the problems the vintage caused the reds were more magnified at this level. Many may probably come through and some were enjoyable, Chateau Couhins red which was nicely handled, springs immediately to mind, but it is more the delicious whites that I remember from this day. Chateau La Garde has made a wonderfully full and impressive white wine [the red is pretty plush too]. Chateau Le Thil Comte Clary, from the Smith Haut Lafitte stable, looked good, as did both Chateau Couhins and Chateau Couhins-Lurton. Olivier Bernard’s Domaine de la Solitude was also good, along with André Lurton’s Chateau de Rochemorin and, to a lesser degree, Chateau de Cruzeau. I also thought Chateau Haut-Nouchet was attractive in a fresh, citrusy way along with Chateau Haut-Plantade, Chateau Le Sartre and Chateau Gazin-Rocquencourt. Amongst the Graves shown at the UGC the whites were again more attractive than the reds. Chateau de Chantegrive has produced a very full white and Chateau Rahoul will take age nicely. Neither of their reds impressed though. Chateau Ferrande made an apple-y white and a reasonable red, though I wouldn’t rush out to order these. Below are all my notes, laid out alphabetically. The three Graves properties tasted at the UGC are at the very end. Deep colour; red fruits, some jam and lift; red fruits again on the palate which feels a bit extracted; little stretched here. 83-85? Tasted Monday April 8, 2013 at Chateau Olivier. White: Pale straw; flinty, grassy nose; fresh and round on the palate with some lees influence and candy tones. Zesty and attractive with flinty notes. 75% Sauvignon Blanc, 25% Sémillon 87-88+Tasted Monday April 8, 2013 at Chateau Olivier. Red: Deep and saturated look; attractive lifted red fruits on the nose; quite satiny palate; ripe and nicely balanced with some grip at the end. Flavoursome. 86-88 Tasted Monday April 8, 2013 at Chateau Olivier. White: very oaky, oyster shell with lots of grapefruit tones and citrus notes; very rich and big; waxy and full palate; lots of weight and some style in an upfront way. Good length and impressive effort. 53% Sauvignon Blanc, 47% Sémillon, 90-92 UGC Weds April 10, 2013. Red: Deep and saturated colour; vibrant at edge; attractive ripe nose; lush and layered; some smoke and plumy notes; attractive palate with fruit as well as oak influence showing in mocha tones but there is plenty of blackcurrant, spices. Very good effort. 48% Cabernet Sauvignon, 47% Merlot, 5% Malbec. 89-91+ UGC Weds April 10, 2013. White: Very pale straw/green; round nose, candy notes and some honey; quite elegant palate; fine and lean; pretty classic Carbonnieux. 65% Sauvignon Blanc, 35% Sémillon. 88-90 Tasted Monday April 8, 2013 at Chateau Olivier. Red: Deep and saturated; ripe and lush nose; pretty fruits; real sense of lushness; palate good entry; ripe; black fruits again, plums, spices; little chewy tannin at the back but good depth. Goodish effort. 40% Merlot, 60% Cabernet Sauvignon 87-89+ UGC Weds April 10, 2013. White: Palest/washed gold; freshness and minerality; feels crisp; palate quite elemental; racy; almost Chablis Grand Cru like. Great minerality. Obvious class, usual restraint. 70% Sauvignon Blanc, 30% Sémillon. 92-94+ UGC Weds April 10, 2013. Red: Deep and saturated; very pretty nose [immediately reminds me of the 2005]; perfume and lushness; lots on the nose; powerful entry; plenty of matter but a little angularity to the tannins on the end which gives a sappy finish. 65% Cabernet Sauvignon, 30% Merlot, 5% Petit Verdot. 89-91+ UGC Weds April 10, 2013. Red: Deep and saturated; black at centre; some earth black fruits, feeling of depth to the nose; some coffee and smokey tones from the oak at the back; sweet entry, black fruits, some oak influence that needs to meld; some chew and grip but ripeness to the tannins; 89-91+ UGC Weds April 10, 2013. White: Pale straw; attractive candy and pear drop notes; fresh with some weight; mid weight palate with apple and pear drop fruit and some flint. Crisp. 86-88 Monday April 8, 2013 at Chateau Olivier’s Pessac-Léognan tasting. White: Pale straw; some apple, another crisp number; fruit; fuller palate; not that bad and quite appetizing. Quite harmonious on the palate. 86-88. Monday April 8, 2013 at Chateau Olivier. Red: Deep and glossy; some purple at edge; lashings of fruit and oak, ripe and very accessible some chewy tannin at the end. 85-87. Monday April 8, 2013 at Chateau Olivier. Red: Deep and glossy looking; ripe, full; some earth; sweetness and depth; palate is full of material, choca-block; lots of material but tannins not puckering or extracted in feel; remains a little chewy on the finish but potentially very strong. 50% Cabernet Sauvignon, 45% Merlot, 3% Cabernet Franc, 2% Petit Verdot 90-92+ UGC Wednesday April 10, 2013. White: Pale straw; precise nose; pear drops, grapefruit; some candy; very attractive; floral characters too; bold palate, pent up; grapefruit tones and spicy notes; very good indeed. Salty finish. Refreshing. 90-92 Tasted Monday April 8, 2013 at Chateau Olivier. White: Pale straw; some wax and wet dog; quite full initially if lacks a bit of zip. OK 85-87 Tasted Monday April 8, 2013 at Chateau Olivier. Red: Deep and saturated look; slightly green note; earthy; dry palate and feels hard to me. 84-86 Tasted Monday April 8, 2013 at Chateau Olivier. White: Pale straw; fresh; some apple tones, candy and some wax; crisp palate and refreshing. Lacks depth and intensity, but has a certain crispness. 84-86 Tasted Monday April 8, 2013 at Chateau Olivier. White: Pale straw; attractive fresh nose; nicely handled; grapefruit and spice; bit of flint; crisp palate with citrus freshness. 86-87+ Tasted Monday April 8, 2013 at Chateau Olivier. Red: Mid depth; very ripe and jammy; strawberry and red fruits; quite worked and jammy with oak and chewy tannin on the finish. 84-86 Tasted Monday April 8, 2013 at Chateau Olivier. White: Pale straw/green tinge; some grapefruit and lees; similar notes on the palate with candy/pear drops. Good effort. 50% Sauvignon Blanc, 50% Sémillon 87-88 Tasted at UGC Wednesday April 10, 2013. Red: Mid depth; vibrant edge; some lift and ripe, black fruits; sweet attack but then come the astringent tannins. Very angular finish. May settle. 50% Cabernet Sauvignon, 50% Merlot 84-86 Tasted at UGC Wednesday April 10, 2013. White: Pale and delicate; flinty; some apple; candy tones on the palate with some lees; little loose on the finish. 43% Sémillon, 24% Sauvignon Gris, 23% Sauvignon Blanc 85-87 Tasted at UGC Wednesday April 10, 2013. Red: Nice colour; glossy; purple at edge; attractive and forward; palate lush entry; spicy quality; some chew but plenty of fruit and less drying than Chantegrive at this stage. Will be OK. 85-87 Tasted at UGC Wednesday April 10, 2013. White: Colourless/green hints; fresh, flinty and grassy tones; waxy palate with lees notes; will age nicely. Lees and wax on the finish. 80% Sémillon, 20% Sauvignon Blanc 87-89+ Tasted at UGC Wednesday April 10, 2013. Red: Mid depth; glossy and vibrant at the edge; some stalky Cabernet highlights; little earth; quite grippy palate [surprisingly] and seems to lack flesh. I’d have liked to looked at this again. 84-86. Tasted at UGC Wednesday April 10, 2013.